Today started like every other Saturday for the past 2 months. We all got up early and headed to Domi’s football game. Today it was in Fernley, about 40 minutes east of Reno. By the third quarter we were getting killed, but still the game was fun to watch. I was on the sidelines on the chain gang (yes, I was doing the chains… does that make anyone else laugh??). We had about 5 minutes left in the 3rd quarter and the Vaqueros (that’s Fernley’s team) ran a quarterback sneak up the left side of the field. He got around several of our guys and he was about 30 yards from the end zone when out of no where I see number 99 (DOMI!!!!) come flying at the guy, wrap him up, and tackle him to the ground. Keep in mind, I’m one of the few moms on the field a nd I’m new at this so I don’t know if I can cheer or not…but I let a huge “WHOOOOOP!! !” fly anyway. I was so proud of my first year player! 10 seconds later, FROM THE OTHER SIDE OF THE FIELD, I hear Domi scream. Have you been there?? Have you heard the distinct sound of your own child rise above 50 other kids voices?? I knew something was really wrong. Domi isn’t a big crier. So I stayed put when he came to the bench and cried in front of his coaches. When they started calling for a medical personel, I dropped my chain responsibility and ran over to see what was wrong. Domi complained of a hurt shoulder. But most of his sidelines tests came back ok. So he sat out the rest of the game, sat through half of the next game that Eva was cheering for, but by the time we left Fernley, his arm still hurt. 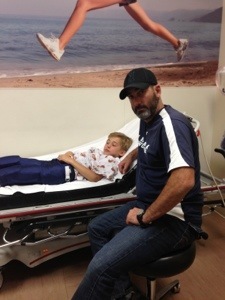 So on the way home we took him to our children’s emergency room at Renown Medical Center. He was such a trooper, no tears, no wincing, no anything. But when the x-ray tech took the first picture, I knew we were in trouble. 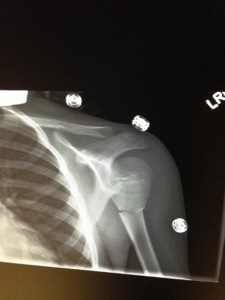 I looked at his shoulder joint, the bone beneath it, and the crack right in the middle of it. 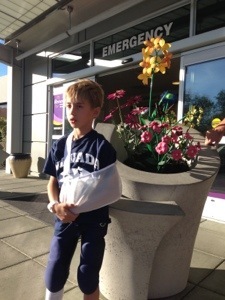 When the doctor broke the news to Domi that his arm was broken, it nearly broke my heart. He teared up a little as he told his dad, “Sorry you wasted money buying me that tee.” (he also kicks for the team). But as we waiting in that little room for his sling, I started looking out the sliding glass door to the corridor of other patients’ rooms. I saw a dad crying in the hallway, a child bleeding from the arm and another being wheeled in a gurney, unable to walk. And while, yes, I was nauseous from Domi’s diagnosis, I still knew that I got to take my child home on this day. Other parents had to look at test resultand see tumors or major diseases or incurable maladies. We had to look at a broken bone. Other parents would have been thrilled with that view. Because it is just a broken arm. So tonight, my thoughts and prayers are with all you parents who went from the ER to a hospital room. To those parents who have a long battle in front of them to save their child’s life. Me? I’m worried about how I’m going to shower my son in the morning. Other parents are worried about if the next drug will be their miracle. For me and my family, it’s just a broken arm. For so many of you, it’s so much more. You are in my thoughts.